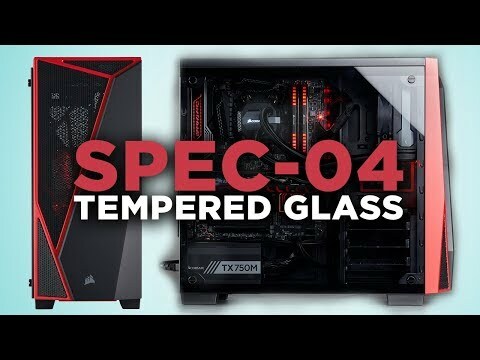 BOLD AND READY TO BUILD The Carbide Series SPEC-04 Tempered Glass combines an angular, hard-edged exterior style with the sophistication of a full tempered glass side panel and excellent cooling potential. The sleek, tempered glass window shows off the roomy interior, which fits up to five 120mm fans and can accommodate massive storage configurations for simple and easy builds. The side-mounted front I/O panel and USB 3.0 port put all your connections within easy reach, while dedicated cable routing cutouts and tie downs, and built-in dust filters, combine for a system build that’s as bold as the SPEC-04’s design. TEMPERED GLASS WINDOW AND ANGULAR PANEL DESIGN Bring bold styling to your system with the SPEC-04's asymmetrical angular design. It offers a coloured front panel with three mesh shapes for improved airflow and one solid shape so you can peek into the interior from the front. On the side is a durable tempered glass side panel so you can see all of your components crystal-clearly in all of their glory. ROOM FOR AIR AND LIQUID COOLING Maximize your cooling potential with the SPEC-04, with room for up to five 120mm fans with one LED front fan already built-in, discover the ultimate cooling setup for your PC. The SPEC-04 is also compatible with a 120mm, 140mm or a 240mm radiator in the front of the case and a 120mm radiator in the rear. ROOM FOR SSD AND HDD The SPEC-04 contains three HDD and two SSD drive cages which are easy to install and allow you to create ample storage solutions for your system. Choose your favorite storage device and house them in this superior gaming case. HIGH SPEED I/O PORTS Featuring a high-speed USB 3.0 port, the SPEC-04 provides super-fast transfer speeds along with additional ports for all the latest connections. CABLE ROUTING CUTOUTS AND TIE-DOWNS Easily hide your cables behind the motherboard tray to keep your build both tidy and aesthetically pleasing. This also keeps your cables out of the airflow path for improved cooling.